Late acting great Anthony Quinn was an artist before he was an actor. He began sculpting and drawing as a child. As a teenager, he studied architecture with famed architect Frank Lloyd Wright. Anthony Quinn continued to create art until his death in June 2001. 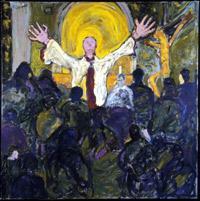 The image shown here is "Promises – Religion" painted by Anthony Quinn in 2000. A traveling exhibition, "Anthony Quinn: A Lifetime of Creating and Collecting Art," recently began a nine-city national tour. The exhibition features paintings, drawings and sculptures by Anthony Quinn, as well as works by Henri Matisse, Pierrre Auguste Renoir and Henry Moore; African masks; Russian Icons; Pre-Columbian sculptures and Latin-American paintings, from Anthony Quinn’s collection. The exhibition is currently at the Owensboro Museum of Fine Art in Owensboro, Kentucky until January 28, 2007. See the official Anthony Quinn website for the full exhibition schedule and more information about his artwork. Visit the Pop Life Art homepage for links to artwork by Anthony Quinn and other celebrities. You may also be interested in Anthony Quinn's Eye: A Lifetime of Creating and Collecting Art at Amazon.com.